INDE – Haryana - Centuries-old artifacts, including pottery and ancient coins, were discovered by a group of labourers who stumbled upon the archaeological trove during a digging work in a field at Hansa Ka village here. The labourers were carrying out work for the construction of a canal under the MNREGA scheme. The antiquities comprise some pieces of pottery, beads of baked clay and several ancient coins, besides a four-feet high primitive pillar. Village elders claim the discovery establishes the factual existence of Mawwa city, which is believed to have flourished here centuries ago. Sudhir Bhargav, convener of the Rewari district chapter of the Indian National Trust for Art and Cultural Heritage, has evinced a keen interest in these archaeological remains. "While the pottery and beads are very much akin to the Harappan era findings which are on display in museums of Pakistan, the pillar, with its ancient engravings, apparently dates back to the 1800-year-old civilization that flourished during the Kushan period," he told reporters here today. He said the coins, which had Arabic inscriptions on them, were of historic importance as well. "However, these historical remains must be examined by specialists of the Archaeological Survey of India to establish their antiquity," he said. FRANCE – Joué lès Tours - Ils sont dix archéologues à plancher quotidiennement sur le chantier des fouilles de Joué-lès-Tours, en face de la mairie. Penchés, accroupis, assis autour des squelettes qui sortent peu à peu de terre. Le site a été découvert en 2010, à l'occasion d'une étude documentaire, le tramway allait traverser complètement l'ancien village de Joué-lès-Tours, et donc passer au-dessus de l'église. Comme toutes les églises de cette époque, elle était entourée d'un cimetière paroissial. Les archéologues estiment que ses premières fondations datent du XI e ou du XII e siècle. Elle a ensuite servi de lieu de culte jusqu'en 1868, date de sa destruction et de son remplacement par l'actuelle église de Joué-lès-Tours. Une centaine de sépultures - au minimum - sont en effet estimées sur le site. Elles dateraient de la fin du XV e siècle au XVIII e siècle. Mais certaines pourraient être beaucoup plus anciennes, et remonter au XII e siècle. ROYAUME UNI – Tadcaster - Assistant curator of Archeaology at the Yorkshire Museum, Natalie McCaul, with the 2,000 year old items found by metal detectorists in a field near Tadcaster. 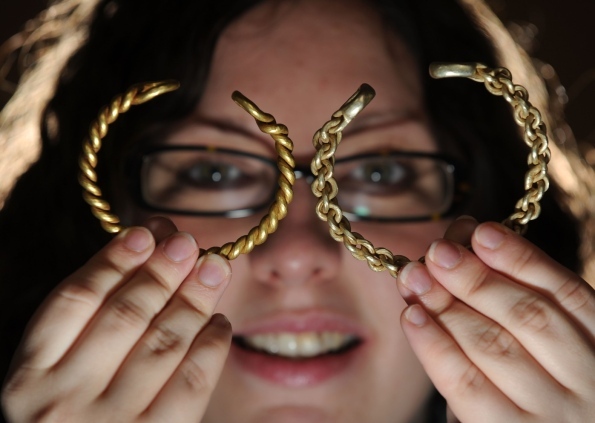 They may each be a little less than three inches in diameter, but two gold bracelets that were discovered in a stream in Yorkshire could help shape a clearer understanding of Britain’s prehistoric era. The two pieces have been declared the first Iron Age gold jewellery ever found in the North of England – and they provide a fascinating glimpse into life in the first century BC. They give the clearest indication yet that there was serious wealth in the area before the Romans arrived, a theory which until the find was only the subject of speculation. Archaeological experts believe the bracelets could have belonged to an extremely wealthy, possibly royal, member of the Brigantes tribe, who ruled most of North Yorkshire during the Iron Age. They hope the jewellery could provide key information about the technology and crafts that were available during the Iron Age to create the intricate pieces. The bracelets could also provide evidence of trading patterns and where the Brigantes tribe settled after they were discovered near the village of Towton in North Yorkshire. CHINE – Shanlonggang - Research jointly conducted by Chinese and US scientists concluded that rice cultivation may have started in east China's Hunan province. In the Shanlonggang archeological site in Linli county in the city of Changde, some carbonized paddy rice dating back more than 8,000 years were discovered Tuesday afternoon, researchers said. The research team will further study the rice to find out whether it is wild or cultivated, said Li Yiyuan, a researcher from the Hunan Provincial Institute of Cultural Relics and Archaeology. Ofer Bar-yosef, a professor from Harvard University, said if the newly discovered paddy can be proved to have been cultivated, it would be the oldest such rice discovered to date. The archaeological excavation started November 1, and is jointly conducted by experts from the Hunan Provincial Institute of Cultural Relics and Archaeology, Harvard University, Peking University and Boston University. The Shanlonggang archeological site, discovered in 2005, is considered a relic of the Neolithic period. Besides the rice, some other objects, including stoneware, pottery and animal bones, have also been also unearthed at the site. EGYPTE – Cypriot Base Ring wares, or what are commonly referred to ‘Bilbils’, are a typological classification of an assemblage of small juglets that appear for the first time at the beginning of the Late Bronze Age (ca. 1650 BCE) in Cyprus. The distinct shape of the vessel was new to the ceramic repertoire of LBA Cyprus and had no antecedents in Egypt or elsewhere in the Levant. The creation of these wares therefore represented a new tradition in commercial production and export. The Base Ring juglet was the most common among all Cypriot wares to be exported to Egypt, and undeniably has made up the largest proportion of all Cypriot pottery uncovered in Egypt thus far. Historically, the LBA in the Near East was characterized by ‘global’ diplomacy and interaction. In Egypt, the Late Bronze Age coincides with the Second Intermediate Period and the 18th Dynasty (ca. 1650-1352 BCE). For much of this period, Egypt was under the direct influence of a Syro-Palestinian population, the Hyksos, who facilitated trade between Cyprus, Syro-Anatolia, the Aegean, and Egypt. With the expulsion of the Hyksos, the 18th Dynasty in Egypt came to dominate this previously established network of exchange culminating in the Amarna period under Amenhotep IV. 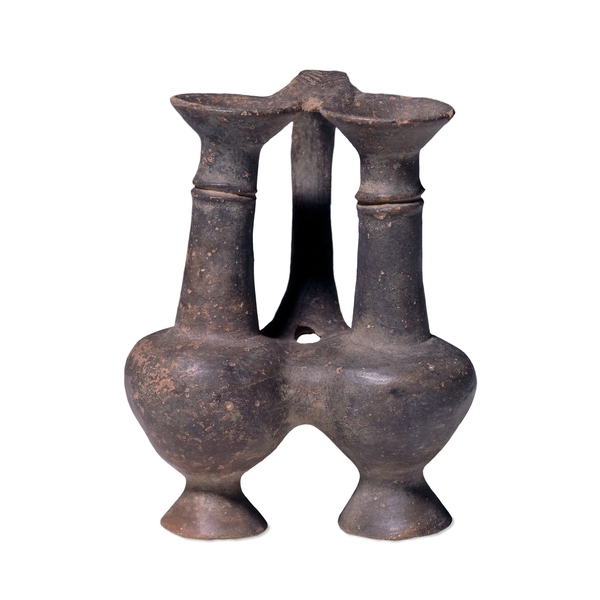 Provided the unique historical context in hich Base Ring I wares were manufactured and distributed, this particular ceramic form provides a unique opportunity to evaluate the role of a unique commodity within the socio-economic sphere of LBA Egypt. 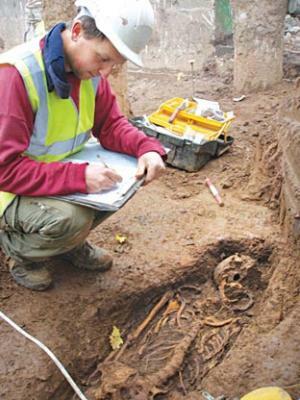 ROYAUME UNI – Upton-upon-Severn - Skeletons discovered as workers built a flood defence in Upton-upon-Severn have been temporarily moved away from the town. The bones were uncovered as excavations were carried out for the new flood defence wall at the Waterside. It is believed they date back to the 1850s, when there was a burial ground in the area, and experts say they will help shed some light on the town’s history and the people who lived there. 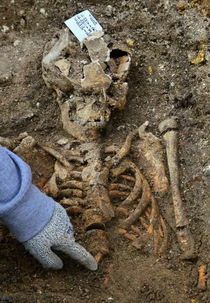 Earlier this year skeletons dating back to the middle ages were also found in Kempsey, near Worcester, during flood defence construction. ROYAUME UNI - Barnstaple. An unusual jug handle that lay buried underground for hundreds of years has been found by a North Devon schoolboy. Adam Andrews, 14, from Great Torrington School, unearthed the 16th century object during an archaeological dig in Barnstaple. The jug handle was one of a number of pottery finds that were uncovered at Litchdon Street. It is decorated with a modelled animal head at the bottom and nobody has ever seen anything quite like it. It is thought to have been made in Barnstaple. 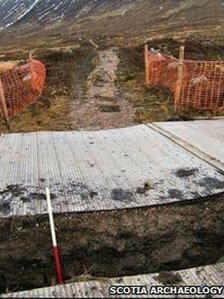 ROYAUME UNI – Inverness - A military road constructed in the Highlands in the 18th Century is the focus of two separate efforts to improve access to it. Transport Scotland is looking at the possibility of an underpass on the A9 to allow walkers and horseriders to reach Wade's Road near Newtonmore. Highland Council, meanwhile, is funding work to cut back vegetation and improve drainage on a section near Inverness. General George Wade supervised road building in the Highlands in the 1700s. The engineer set out basic rules for military road building from central Scotland to the north to ease the movement of government troops. Major William Caulfield succeeded Wade as the military's chief road builder in 1740 - however the routes continued to be better known as Wade's. The roads were constructed following the failure of the Jacobite uprising of 1715. They linked up forts from Perth to Fort William, then north to Fort Augustus and Inverness. Large sections in the Highlands were later built over, while surviving stretches are now tracks used by walkers and horseriders. FRANCE – Saint Médard - Les techniciens de l'archéologie préventive ont travaillé hier sur l'emplacement qui doit accueillir l'un des deux containers enterrés (devant l'ancienne poste, rue de l'Hôtel-de-Ville). Ils ont mis au jour une citerne ou un puits, remontant sans doute au XVIII e ou au XIX e siècle. Rien qui soit de nature à bloquer le chantier.